Zipai, or ‘taking a picture of oneself’, is an extremely popular practice across an increasingly digitally mediated China. The principal platforms through which Chinese digital media users share their zipai are mobile micro-messaging and social contact apps such as WeChat. 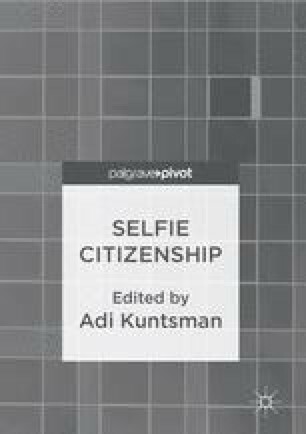 This chapter follows a highly visible media event – the 2015 V-Day military parade in Beijing – and its representation across micro-media practices of spectatorship to rethink the role of zipai in the construction of contemporary forms of Chinese citizenship. Li, Y. (2015). The 9.3 Beijing V-Day Parade - a Chinese perspective. Medium. https://medium.com/@yinuoli/the-9-3-beijing-v-day-parade-a-chinese-perspective-88f202f670b6. Accessed 7 October 2015. Lu, S., & Chan, W. (2015). Blue sky vanishes immediately after Beijing’s massive parade. CNN. http://www.cnn.com/2015/09/04/asia/china-beijing-blue-sky-disappears-after-military-parade/index.html. Accessed 7 October 2015. Page, J., & Wong, C. H. (2015). China flexes its military muscle at World War II parade. The Wall Street Journal, http://www.wsj.com/articles/china-flexes-its-military-muscle-at-world-war-ii-parade-1441282579. Accessed 7 October 2015. Phillips, T. (2015). Chinese military parade’s main message is not peace but power. The Guardian. http://www.theguardian.com/world/2015/sep/03/chinese-military-parade-peace-power-xi-jinping. Accessed 7 October 2015. Tang, S., & Zhao, G. (2015). Guowuyuan: Jinnian 9 yue 3 ri kangzhan shengli 70 zhounian jinianri fangjia 1 tian [State Council: In occasion of the 70th anniversary of the victory of the war of resistance against Japan, this year’s September 3rd will be a one-day holiday]. Renminwang. http://politics.people.com.cn/n/2015/0513/c1001-26993366.html. Accessed 7 October 2015. Wertime, D. (2015). A day to watch in China: September 3, 2015. Tea Leaf Nation. https://foreignpolicy.com/2015/05/13/a-day-to-watch-in-china-september-3-2015-japan-tension. Accessed 7 October 2015. Xinhuanet. (2015). China holds V-Day parade. Xinhuawang. http://www.xinhuanet.com/english/special/vday2015. Accessed 7 October 2015.